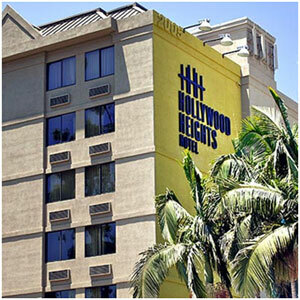 An affordable dash of Hollywood is only a stone’s throw from the city’s major attractions at the Hollywood Heights Hotel. 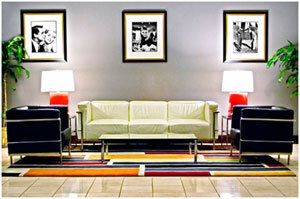 This boutique hotel is comfortable, stylish and offers superb customer service to boot. Unassumingly located on Highland Ave, just behind the Kodak Theatre, I received a ‘Hollywood’ welcome from the moment I drove onto the premises. The valet kindly offered to take my bags and directed me through to the lobby where I was greeted by George Clooney! Yes, George had recently taken up residence in the stylish lobby…right next to the Madame Tussauds sign! Why check in right away when I had the opportunity to snuggle up to one of the most desired men in the world? With a jam-packed schedule for my short stay in LA, the staff accommodated me so well and they always did so with a smile. My room was generously sized with a comfortable king size bed that was very welcome after the long haul flight from Sydney. I was hoping for a glimpse of the Hollywood sign from my room but I was located at the back of the property so only overlooked the car park but, with Hollywood right outside my doorstep, I knew I wouldn’t be spending too much time worrying about that! the amount of cosmetics I tend to pack when travelling! Looking forward to dining in on my first night after a jam-packed day at both Universal and Warner Bros Studios, I was disappointed to find that room service was not offered. Concierge provided me with an array of local home delivery menus however and I tried an interesting Mexican meal that I can’t say I would try again! Complimentary Wi-Fi meant I could update my friends and family on my trip and also make free phone calls to Australia via ‘Tru-Phone’ a must-have for me when travelling. For a mere USD$8 per month I can call a range of countries free of charge when using a Wi-Fi connection (otherwise it uses up your data connection). Hideout Bar’ during my time there, I have bucket listed the ‘Hollywood Walk of Fame’ martini for the next time I visit. The bar also features regular live entertainment and is designed in a way that you feel completely removed from the hustle and bustle of Hollywood just through the palm trees. Something that surprised me when returning to my room was noticing pets at the hotel. Never before have I stayed at a property that was ‘pet friendly’ but, contrary to what I would have expected, the hotel didn’t smell nor was it noticeable that you may be sharing a floor with a pooch or two. With more and more people choosing to travel with pets it was refreshing to see a hotel really cater to the needs of all their guests. when it actually is sunny enough to enjoy the area! Simple, yet stylish, poolside is quite a draw card to hold events and sometimes guests can even enjoy live entertainment over the summer months. Pros: Location, location, location – you can easily walk to the most famous tourist spots in Hollywood without breaking a sweat. 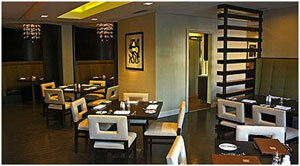 You feel like a part of the family with such helpful and friendly staff. It’s rare to find a property in Hollywood that evades pretentiousness but this is definitely one of those. 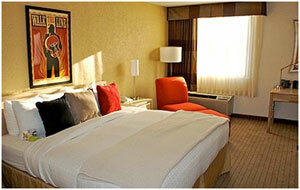 Cons: The rooms are quite basic in styling and the lack of room service was a major con for me. Thank you! Have a fabulous time in LA!